11-15 Jun, 2018: 14th meeting [agenda] in Boulder, University of Colorado (USA). 10-14 Jul, 2017: 13th meeting [agenda] in Newcastle, Newcastle University (UK). 08-12 Aug, 2016: 12th meeting [agenda] in Graz, Space Research Institute, Academy of Sciences (Austria). 11-15 May, 2015: 11th meeting [agenda] in Trondheim, Norwegian University of Science and Technology (Norway). 07-11 Jul, 2014: 10th meeting [agenda] in Göttingen, Max Planck Institute for Solar System Research (Germany). 17-20 Jun, 2013: 9th meeting [agenda] in Lund, Lund Observatory (Sweden). 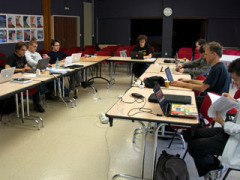 18-21 Jun, 2012: 8th meeting [agenda] in Helsinki, Physics Department (Finland). 24-28 Oct, 2011: 7th meeting [agenda] in Toulouse, Observatoire Midi-Pyrénées (France). 26-30 Jul, 2010: 6th meeting [notes] in New York, American Museum of National History (USA). 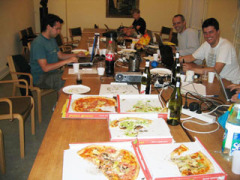 24-28 Aug, 2009: 5th meeting [agenda] in Heidelberg, Max Planck Institute for Astronomy (Germany). 19-22 Aug, 2008: 4th meeting [agenda] in Leiden, Leiden Observatory (Netherlands). 14-17 Aug, 2007: 3rd meeting [notes] in Stockholm, Nordita (Sweden). 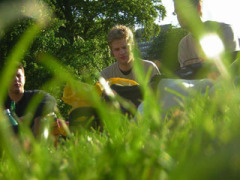 13-15 Jul, 2006: 2nd meeting [videos] in Copenhagen, Nordita (Denmark). 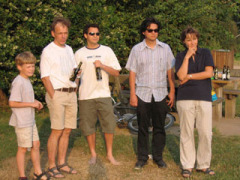 26-28 Jun, 2005: 1st meeting in Copenhagen, Nordita (Denmark).